The Rabbi with a Blog (Rabbi Jason Miller): Celebrity Ushpizin - Who Would You Invite into Your Sukkah? 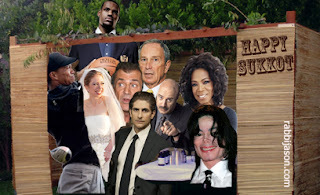 Celebrity Ushpizin - Who Would You Invite into Your Sukkah? If you’ve never heard of the custom of “Ushpizin,” it’s sort of like inviting dead relatives to a dinner party. Ushpizin is derived from the Latin hospes meaning guests (like hospitality). According to Kabbalah, there are seven ancestral guests we invite into our sukkah: Abraham, Isaac, Jacob, Moses, Aaron, Joseph, and David. Today, some invite the famous women from Jewish history as well. 1) Mayor Michael Bloomberg – He’s just so Jewy and the gazillionaire probably wouldn’t have a problem picking up the tab for the food. Plus, his take on the whole Islamic center and mosque by Ground Zero controversy makes for interesting dinner conversation. 2) Chelsea Clinton – She just married a Yid, so why shouldn’t she have a nice meal in my sukkah during her first Sukkot. 3) Mel Gibson – After spending a nice evening under the stars with some yummy Jew food, even this guy might warm up to the Chosen People. Plus my wife’s matzah ball soup will help him relax a bit. 4) Tiger Woods – I mean, where else is he getting a home cooked meal these days? And, I’d love to see him hit an etrog with his 9-iron. 5) Michael Jackson – Hey, if we can invite King David into our sukkah, why can’t we invite the King of Pop? 6) Michael Imperioli – The Soprano’s star has been in “The D” filming the new cop drama “Detroit 1-8-7” so I figure he can provide some protection for the other celebs in the sukkah. 7) LeBron James – He’s upset with Dan Gilbert’s irate letter after he left Cleveland for Miami, so a little love from the Jews would help. But I am a little concerned about the 6 foot 8 NBA star fitting in my sukkah. 8) Oprah and Dr. Phil – With all these celebs, we’re going to need someone to moderate and someone to provide some therapy and I guess these two are a package deal anyway. Oh, and of course my grandma’s invited. What’s a holiday meal without Bubbie? I just hope Mel Gibson watches what he says. If you could invite eight celebrities for a night in your sukkah, who’d be on your guest list? Leave your list in the comments section below. 1. My mama so I could explain the custom of mourning that I'm following for her She was not Jewish by any means and would likely have questions such as: why are we sitting in an unsafe looking hut when you have a nice house right over there, and why are we eating this nasty, sour fruit when apples are easily found this time of year and what are those branches? There are perfectly good oak and maple leaves this time of year that have more color. 2. My grandma and grandpa so I could explain to them that when I start learning Hebrew the only words I knew were from the blessing they recited as they lit the Shabbat candles when they came to visit us. And I always remembered them letting me sit with them as they did it and prayed and how warm that felt. 3. Rashi--I have a lot of questions. 4. Akita--I have a lot of questions and I want to know how he was able to run a profitable farm and have time left over to study. 5. Rebbitzin Akita--so I can ask her if she ever minded that he was always busy either farming or studying. 6. Lot's daughters. Really? You thought everyone in the world had been killed off and you thought it was important to have life go on that much? 7. Mike Ditka to lighten things up and add some color to the evening. Rav Shach and the Lubavitcher Rebbe. Just a BTW: those guests? they aren't people, they're (the lower seven) sefirot, represented by the people to whose trait they're assigned. that's why there's a traditional female ancestor also assigned - because the sefirot are traditionally represented by quite a few people on both sides of the gender divide. Michael Jackson would obviously represent Keter. He was, after all, the King of Pop!